priorities ;) ! after teaching my early morning Barbell Strength class, i sped over to Whole Foods Market and picked up a birthday cake for Sonny! eeeerrrrrmygash! it was a gorgeous, layered vanilla cake on the inside. italian cream icing. almonds. sugar infused strawberries. happy birthday, papa!!! from your little minions <3 i found the boy's shirts @ Target. i told Sonny to get up and get dressed, pack an overnight bag, and to make it snappy. a kid-free trip is what i had planned, but after my sitters and backup sitters fell through we ended up bringing the boys! 1st thing on my agenda-- FOOD. we headed to lunch and i totally did my research on this place beforehand. Sonny wanted to stay as close to his meal plan as possible but enjoy his special day, and boy did we! Jerry Built takes pride in their all natural, organic, antibiotic-free, hormone-free, grass-fed chicken and beef, they don't use trans fat or hydrogenated oils, and the produce is organic and/or local. they get brownie points from me for presenting the food just like it's displayed on the menu and online! Sonny got the super tasty Saint Arnold burger on a baked, toasted, whole wheat bun, and swapped out the french fries for a caesar salad. i ordered this beauty-- Jerry's Cobb. the cashier asked me immediately, 'and would you like to add grilled chicken?' which is what i planned to do. i guess that is a popular menu combo there. yall, the flavors in this thing were POPPIN'! 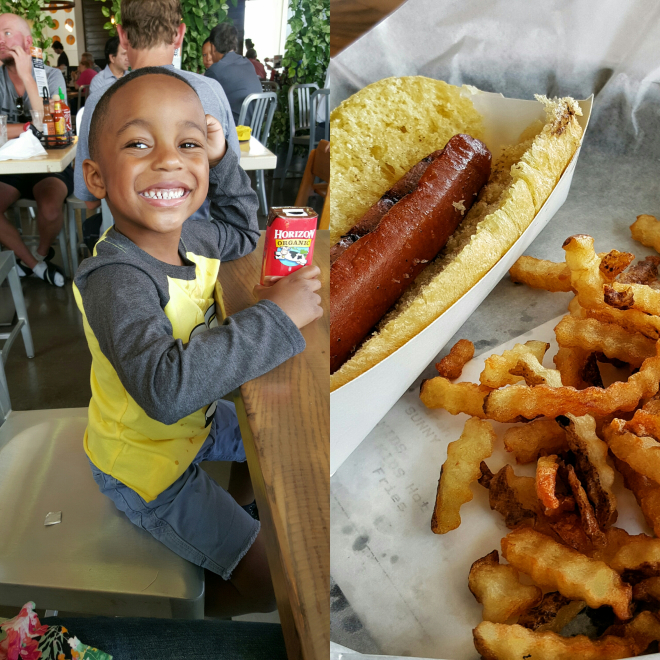 Chiso was very happy with his nitrate-free, angus beef hotdog, fries, and chocolate milk. there was a giant, kid friendly chalk board towards the front of the room that Chiso wanted to leave his mark on. way cool! neeeeext, we hit the road. 40 minutes later we arrived on Galveston Island, but not before stopping by Kroger to get baby Dego some baby Ambesol! about halfway to G-town, he let out a cry both Sonny & i had never heard before. he was in so much pain from teething and i am honestly glad the kids were with us at that point. after some Abesol, a diaper change, and some nursing, he did a complete 180. whew. this pic is hilarious to me because my face looked like the minion's face on the drive there, haha! 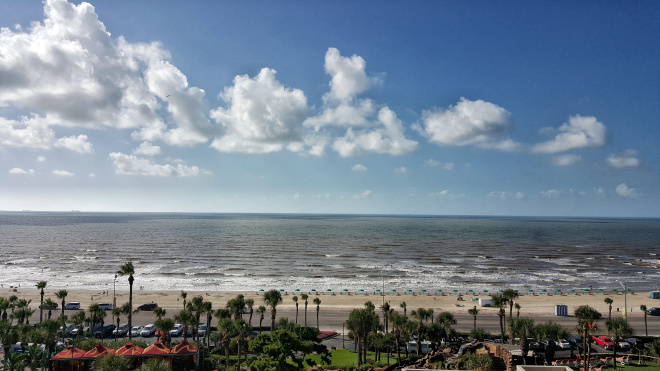 our view from the San Louis Resort! i sent Sonny to the spa for his pedicure while the boys and i relaxed and did a Periscope vid. i've been saving them via katch.me for the past few days so they aren't gone forever anymore. kinda glad the first few vids i did are though lol. after he finished, we hit the beach. but not before grabbing something to eat downstairs at Grotto. i had plans for a nice dinner later that evening but no way we could have waited that long to eat. 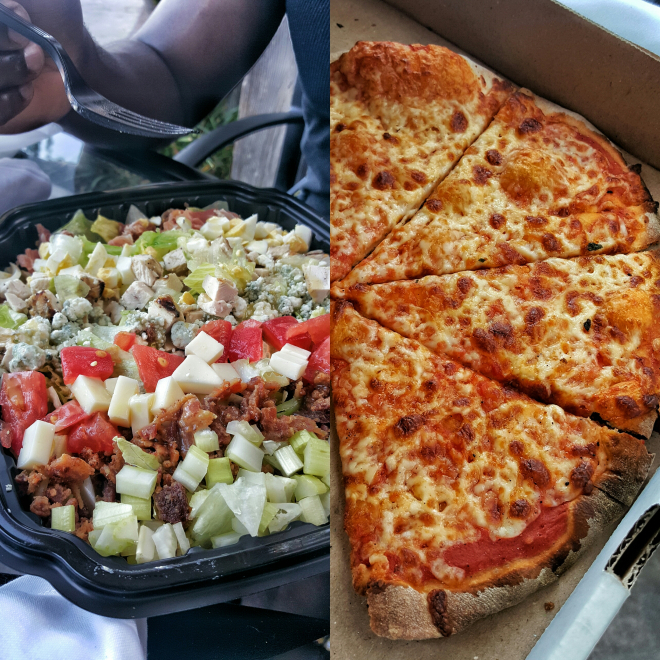 hunger attitudes kill good vibes every time. Chiso was beyond excited for his first time at the beach! i cannot WAIT to see his reaction when we go to Disney World, then! he told me his favorite part of the day was this moment right here...making sand castles with papa. we took a dip in the hotel pool on the way back to our room. afterwards, we changed and got ready for dinner. we traveled about 12 minutes away from our hotel to Rudy & Paco. it was an excellent suggestion by my sister-in-law Kara! birthday boy got steak and spinach, i got the salmon & sautéed sugar-snap peas, and from the 'off the menu' kids menu, Chiso requested a grilled cheese sammich and fries. the owner was extremely warm, welcoming, and stopped by to chat with us and to wish Sonny a happy birthday. back to z hotel! 12 minutes away and everybody was asleep when i pulled up to the valet. we're familiar with co-sleeping at home now and then, so 4 in 1 bed was nothing new. we got up the next morning, checked out, and headed to breakfast at IHOP. this boy ate good the entire trip, right!? read the entire menu. 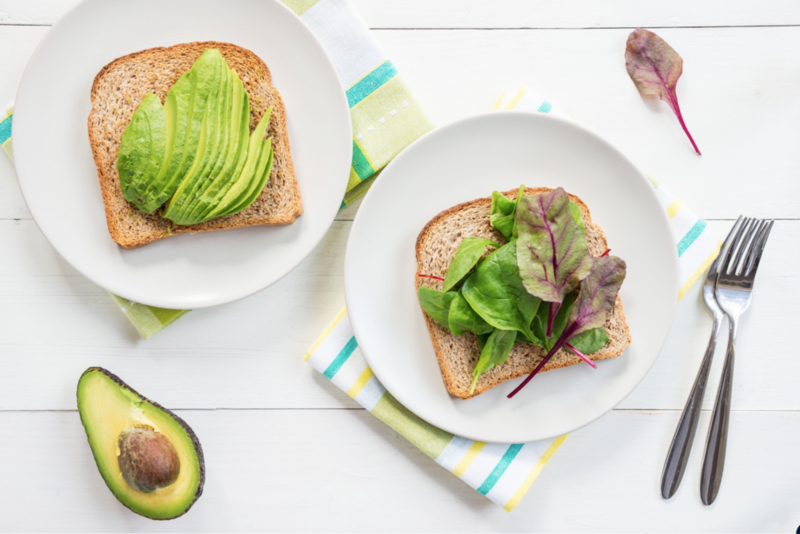 there are sometimes specialty diet sections (gluten-free, vegan, dairy-free, etc.) or sections with healthier/lighter options. 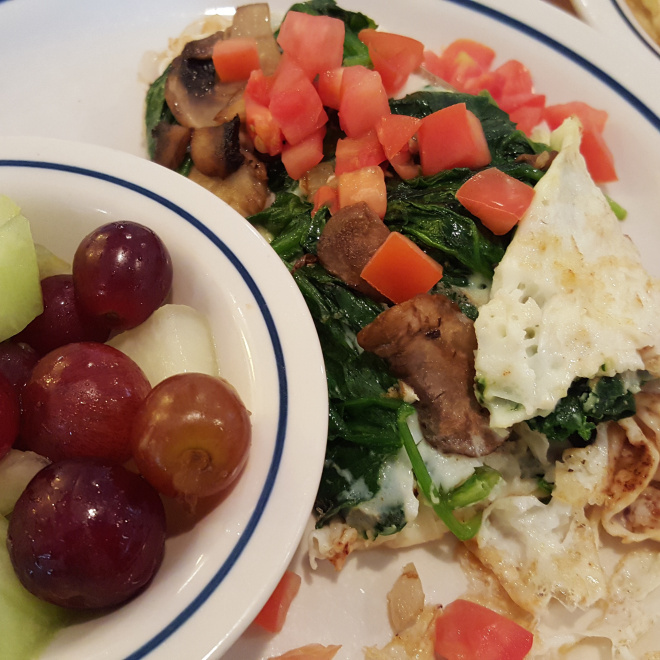 All meals in IHOP's Simple & Fit section are 600 calories or less, and contain lower sodium options as well. peruse the kids menu. the portion sizes are sometimes perfect for adults. at IHOP, all the Just For Kids options are 600 calories or less. they are usually smaller versions of the adult plates, so you still get a bit of everything without going overboard. switch your syrup. IHOP uses Carey's sugar-free syrup, but you have to ask for it! most likely the syrups already out on your table are 110 calories (or higher) and 28g sugar per 1/4 cup. and who uses 1/4 cup of syrup on their pancakes!? also, nix the butter. use your swaps. my meal actually came with potatoes but i swapped them for fruit. you can also swap turkey bacon for pork bacon. fresh fruit is now the default side for the lunch and dinner meals instead of french fries. Stevia to the rescue. bring your own all natural, zero calorie Stevia to sweeten your coffee and tea with. the artificial packets already on the table will never compare nor will they do your body any good: Splenda - yellow, Equal - blue, Sweet N' Low - pink. IHOP's nutritional stats are finally listed online and are updated frequently (they were one of the last restaurant chains to release this info), so take a peek ahead of time or while you're waiting to order your food. utilize your resources; the info is right there for you! chiiiiiiiill. don't stress or get apprehensive about dining out. chances are there is something on the menu for you! even if the menu is set, you can simply ask for your dish to be made your way. if you didn't katch our Periscope vid explaining some of the above info, watch it here. thanks for reading and HAAAY MONDAY! Q: have you ever ordered from the Simple & Fit section @ IHOP?